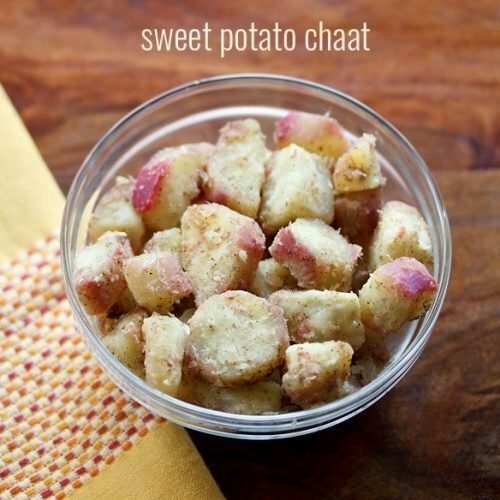 sweet potato chaat is one of the easiest to prepare chaat recipe with sweet potatoes or shakarkandi. firstly rinse 260 to 270 sweet potatoes very well in water. then steam them in a pressure cooker or a pan. if cooking in a pressure cooker, then pressure cook for about 3 to 4 whistles with water just about covering the sweet potatoes. after the sweet potatoes are cooked well and when they become warm, then peel them lightly and chop them. take them in a bowl. add 1/4 teaspoon black pepper powder, 1/2 teaspoon amchur powder (dry mango powder) and rock salt (sendha namak). if making for regular days, then you can also add red chilli powder and chaat masala powder. some roasted cumin powder can also be added. you can add the spice powders less or more as per your taste preferences. then 1/2 to 1 teaspoon lemon juice. mix gently. check the taste and add any of the spice powders or lemon juice if required. you can also add 1/4 to 1/2 teaspoon roasted cumin powder in the recipe. if not making for navratri fasting, then you can use red chilli powder, chaat masala. black salt can also be added instead of rock salt. spice powders can be added more or less as per your taste preferences.